Home/Posts/Vembu BDR Suite v4.0 is now Generally Available(GA) with Hyper-V Cluster Backup & other major features. Vembu BDR Suite v4.0 is now Generally Available(GA) with Hyper-V Cluster Backup & other major features. 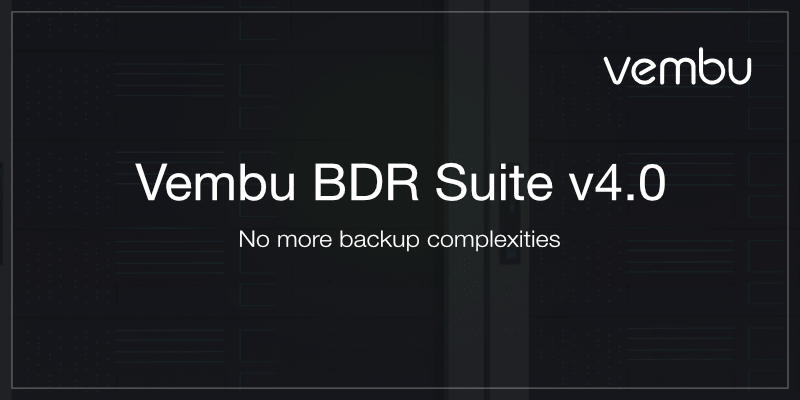 We’re happy to release our latest upgrade Vembu BDR Suite v4.0 that comes with new features and many enhancements that make VMware and Hyper-V Backup and Recovery easier and more powerful. Across all these interactions, one question has been constant: When can we expect Vembu BDR v4.0? This blog will provide an insight into the new features that will be available with this release and the other enhancements. No matter how complex or mixed your IT environment is, v4.0 will be a competent BDR solution that addresses all your needs. Download Vembu BDR Suite v4.0 today and experience modern data protection for your environment. Interested in trying Vembu BDR suite?, Try a 30-day free trial now!